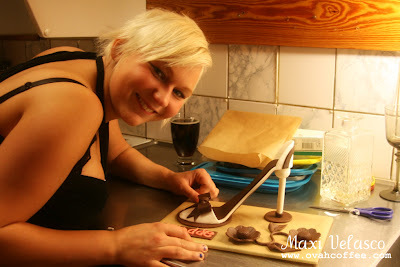 Madde, my boyfriend's only sister celebrated her 22nd birthday last Monday, 20 September at their mom's apartment. Everything went on as planned. Taco dinner. PS3 Tennis and Tekken games. Special moments captured. Coffee break along with chitchats. The night was completed with Madde's birthday cake ~~~ a cake I proudly made myself ~~~ A SHOE CAKE! 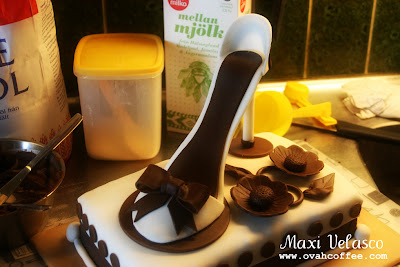 I put a lot of thought into this cake. 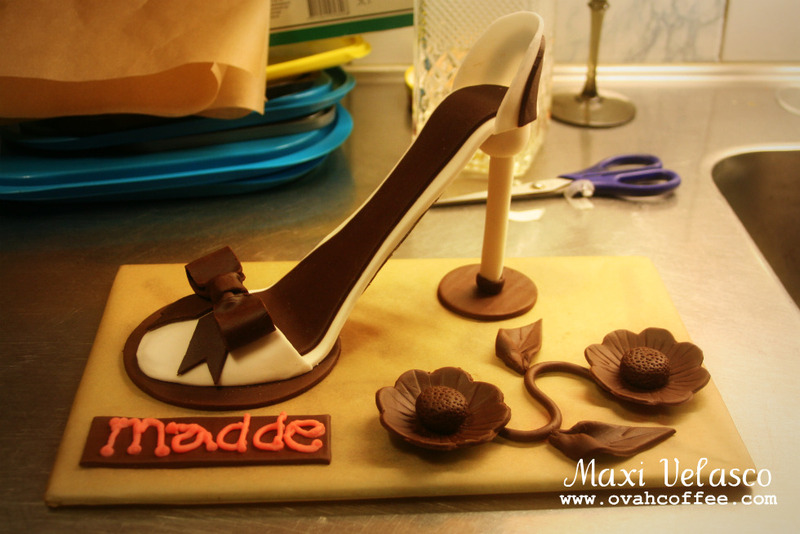 Since I used fondant, sugarpaste and modelling chocolate to complete its entire design, I needed to create the decorations ahead of time to give it some time to dry. 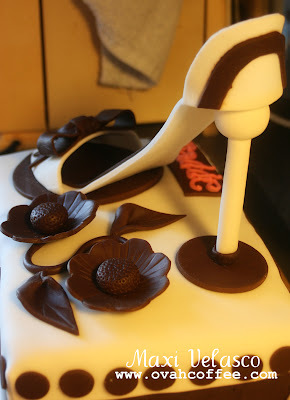 For the shoe, two and a half days to harden while the chocolate leaves and flowers, a day and a half. 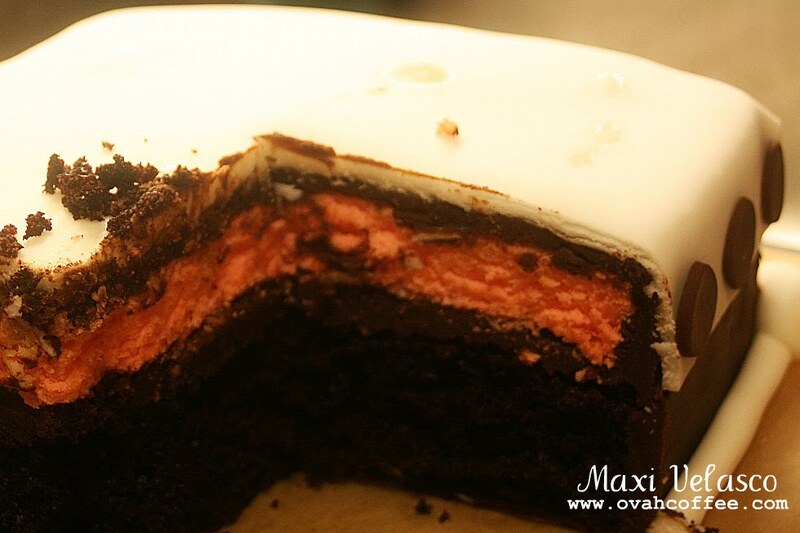 I baked a thick layer of moist chocolate cake and a thinner layer of pink sponge cake four hours before the party. I prepared chocolate ganache to fill and frost the cake then covered it with a roll of white fondant, decorated it with dots made of chocolate and added the final details ~~~ the shoe and the flowers. It did really look oh so good and yummy! Madde decided to keep the top of the cake for as long as possible. I was so happy that she loved it! We enjoyed the cake together with a cup of newly brewed coffee while playing Poker. The night started and ended well. Excellent! Thanks Bingkee! Thankie thankie. May mga orders na nga for October. Di ko akalaing it would go this far. Have a great day pretty Bingkee! Enjoy your vacation! Wow! Ang sarap niyan....Mmmmm....Ang galing mo Sis....GREAT JOB!!! The beautiful output convinced me that you're an expert in this field, pretty Maxi. Your creativity and passion is very obvious. Nicely done. Keep it up!